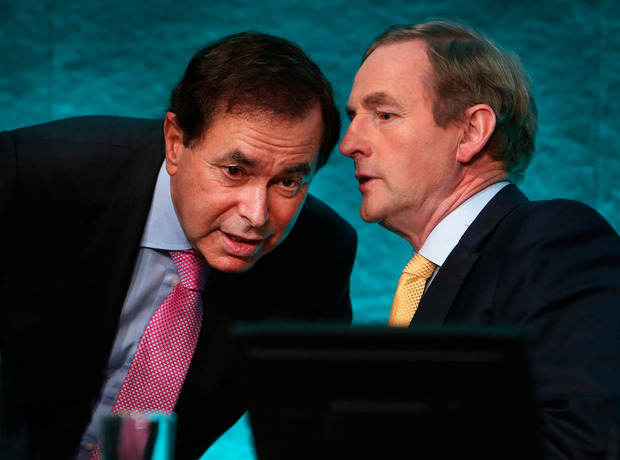 Former Justice Minister Alan Shatter has delivered a scathing critique of the Taoiseach Enda Kenny, accusing him of "misuse of power" and putting his own political survival before the good of Fine Gael and the stability of the country. Writing in today's Sunday Independent, Mr Shatter excoriates his one-time political ally for running Fine Gael as "a semi-secret society" in which is it acceptable to "destroy" those who speak out against the leadership. In a devastating attack on the Taoiseach, Mr Shatter accuses Mr Kenny of having "no moral compass" and says "if nothing changes" Fine Gael will be in opposition after the next general election. "Enda Kenny has only one strategy - continuing political survival and to remain Taoiseach and in government for as long as possible. Retention of power is the only game in town," Mr Shatter writes. He says "principle, values, fiscal and economic objectives, social priorities, concepts of public service and of the public good or the long-term political health of the Fine Gael party" are no longer the Taoiseach's focus when he is making political decisions. "For the Taoiseach, doing what is right for the country has come to mean doing what is required to politically survive and remain Taoiseach for as long as he can string it out," he adds. He also says the Taoiseach's potential successors "remain silent and look the other way" as they fear a premature move or critical comment could "scupper their leadership ambitions". The unprecedented public criticism of a sitting Taoiseach by a former minister and party colleague will cause huge embarrassment for Mr Kenny and raise serious questions about his continued tenure at the helm of Fine Gael. Mr Shatter once had a very close working relationship with Mr Kenny and was a loyal supporter during the infamous 2010 internal Fine Gael heave against the Taoiseach. However, in his blistering 1,700-word rebuke on the Fine Gael leader, Mr Shatter says there is a "sense of impunity and no fear of accountability" among the Taoiseach and his closest advisers. He says political controversies faced by Mr Kenny and his team are "controlled and managed, and, where necessary, by facts and events being spun and distorted". Mr Shatter says, under the leadership of Mr Kenny, it has become acceptable in Fine Gael to "destroy the reputation, career or wellbeing of individuals" who have the "integrity or courage to challenge the fabricated stories, self-serving spin and misuse of power" now associated with the Taoiseach. Mr Shatter was forced from office by Mr Kenny soon after the Taoiseach received the Guerin Report, which was critical of the then Justice Minister's handling of allegation of garda misconduct from whistleblower Maurice McCabe. Earlier this year, Mr Shatter won a Court of Appeal case which overturned some the of the controversial findings made against him in Barrister Sean Guerin's investigation. But it has recently emerged that Mr Guerin has lodged an application to appeal to the Supreme Court, seeking to overturn the Court of Appeal ruling which cleared Mr Shatter of any wrongdoing. It is understood Mr Guerin's costs, should his case be accepted by the Supreme Court, will be covered by the State. Mr Shatter today writes that he "committed the sin" of challenging Mr Guerin, who was appointed by the Taoiseach, in the courts. He also criticises the Taoiseach for failing to acknowledge that Attorney General Maire Whelan overreacted when she learned gardai were secretly recording telephone calls as was set out in the Fennelly Commission's final report. Mr Shatter also says the Taoiseach ignored that Mr Justice Nial Fennelly reported that if the then Justice Minister had been informed sooner of the secret recordings by Ms Whelan, it "would have made a significant difference to the events as they unfold". Former Garda Commissioner Martin Callinan retired on the same day the tapes emerged publicly. Mr Shatter says it gives him "no pleasure" to write about Mr Kenny as he believes he will be "criticised and denigrated" by his former colleagues. He says his Fine Gael Cabinet ministers will recognise "truth in at least some" of what he has written but will "choose to ask no questions and look the other way to avoid charges of disloyalty". He adds: "Both they and some commentators will inevitably depict me as having some chip on my shoulder when I am simply saddened by what has happened to a Fine Gael leader (and some other former colleagues with whom I closely worked) who I used to greatly like, admire and respect, and a party to which I have been devoted for almost my entire adult life." Mr Shatter says he wrote the deeply critical article as a call to Fine Gael members to recognise "unquestioning loyalty is not enough". "It is a call for action to ensure Fine Gael has a future role that matters and it is recognised that there are core values that must be respected in public life that are bigger and more important than any individual politician's ambition and self-interest and any one political party being in government," he adds.